Money Matters - File bankruptcy or not? The purchase of a home – whether it be your first house or your fifth – can be a whirlwind experience. So why should you be thinking about one more thing? Why should you be thinking about your title company? Title companies are most often chosen by the buyer’s lender. But it is a law in the State of Maine that the buyer has the right to choose their own title company. In this article, I go through exactly what a title company does, and in a future article, I will discuss how to choose the right one for you. First and foremost, the title company performs a title search, which determines if the person selling a property truly has the right to do so, and that the potential buyer is receiving all of the rights to the property (title) that they are paying for. The reason a title company conducts this search is to ensure the property is conveyed with free and clear title with no liens, outstanding mortgages, and that real estate taxes, water and sewer, are currently paid up. When the title search is complete, the title company will then issue a ‘commitment’, which states the conditions under which it will insure the title. The title company processors then become the point of contact for the buyer, seller, brokers and lender. It is the processor’s responsibility to plug in all of the monetary figures associated with the transaction. Once all of the figures have been established and the lender has given the clear to close, the processor then contacts all parties to coordinate the closing date, time and location. At this point, the processor awaits the lender’s documents and puts together the closing package with all of the necessary paperwork – some generated in-house and some from the lender. It is then handed off to the closing attorney who will facilitate the actual closing with the buyers, sellers, brokers and lender. The title company’s closing attorney will walk you page by page through each of the many documents you will be required to sign, and there are a lot of them! It is very important for the title company to explain everything being signed. Once that is done, the transaction is complete and the new owners may officially move into their new home. However, work continues behind the scenes! The title company must record certain documents, such as the deed and mortgage, at the Registry of Deeds. They are also responsible for sending the proper paperwork to the lender, and paying off mortgages, home equity loans, water/sewer bills, property taxes and HOA/condo fees, among other possible payments. Usually within one month from the transaction closing date, the buyer will receive their final correspondence from the title company in the form of a letter which includes their owner’s title insurance policy and their recorded deed. Title companies are truly a part of the home purchasing process, and I will explain in the next article how to choose the right one for you. It’s never too early to plan ahead for college for children through Maine’s NextGen 529 college savings plan. The benefits for Maine residents can add up to a lot of money. When you open an account for a child over a year old, get a $200 matching grant with a $50 deposit. For children born this year, they can get an $500 Alfond Grant to be used for higher education. The second way to get grants in the Next Gen program is to make contribution and get a 50 percent NextStep Matching Grant up to $300 per year. Finally, for those who set up automatic contributions from a payroll or bank account, they receive a $100 automated funding grant. The money in a 529 plan are earmarked for higher education no matter the age of the student. The money grows tax free and beneficiaries can be changed. 529 plans can be set up by financial advisors like those at Modern Woodmen in Windham. For more information on the Alfond, visit www.500forbaby.org. For more about NextGen, visit www.nextgenforme.com. Every year, due to common mistakes, billions of dollars in refunds are left uncollected by taxpayers from the Internal Revenue Service (IRS). Liberty Tax examines the Top 10 tax mistakes made each year by taxpayers in hopes to prevent them from repeating errors that may cost them money. • Staying Up-to-date on The Tax Code: The biggest tax news of late is the Affordable Care Act and how Americans will be responsible for the Shared Responsibility Payment if they do not have health insurance and are not exempt from obtaining coverage. Taxpayers need to research the latest changes to the tax code before filing their own taxes. • Not Claiming All Earned Income: If examiners find money a taxpayer earned and did not report, the taxpayer could owe interest and penalties, in addition to the tax that would be owed on the income. • Number Errors: Another common mistake that could cost taxpayers is entering numbers on a tax form. A costly error, for example, could be entering in the wrong bank account number when requesting a refund to be direct deposited. The refund could actually be deposited into someone else’s bank account. • Math Errors: Careless math mistakes cost taxpayers each year. • Filing Under the Correct Status: With five different options available under filing status, the most accurate one for a taxpayer’s situation may not be easily determined. 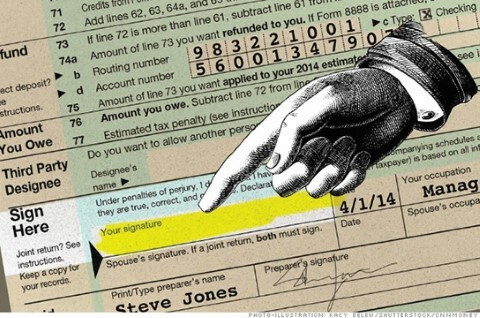 Each filing status could have an impact on the tax liability outcome. • Mismatched Names: If a taxpayer’s name does not match the name and Social Security number the IRS has on file, the tax return could get kicked back or the process could slow down. • Paying Multiple State Taxes: Many taxpayers forget that income earned in another state must be reported. If taxpayers fail to file this return, they could face fines, fees, and penalties, in addition to the taxes owed. • Forgetting to Sign the Forms: It is an all-too-common mistake to forget to sign on the bottom line. For those who owe and wait until the deadline to file, forgetting to sign their tax return could cost them a late fee and penalty when the IRS kicks it back for signature and April 18th has passed. • Falling for Tax Schemes: If a taxpayer believes he or she may be at risk for identity theft, the taxpayer should contact the IRS Identity Protection Specialized Unit, toll-free at 1-800-908-4490. • Missing a Deduction or Tax Credit: While penalties and fees mentioned above could cost a taxpayer plenty, missing a deduction or tax break could cause the taxpayer to owe more than he or she should or get a lower refund than what they earned. This article was brought to you by Liberty Tax Service. “Tax preparers at Liberty Tax Service constantly undergo training to stay updated on the current tax laws and changes. It’s not just our customer service that keeps people walking through our doors every year, it’s the peace of mind they get with our tax preparers,” said Adams, owner of Liberty Tax Service in Windham. The Bipartisan Budget Act of 2015 included a section titled “Closure of Unintended Loopholes” that ends two Social Security claiming strategies that have become increasingly popular over the last several years. 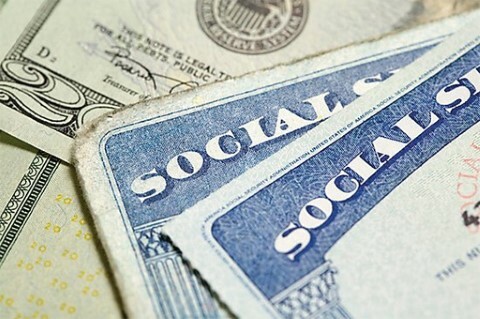 These two strategies, knows as “file and suspend” and “restricted application” for a spousal benefit, have often been used to optimize Social Security income for married couples. If you have not yet filed for Social Security, it’s important to understand how these new rules could affect your retirement strategy. Depending on your age, you may still be able to take advantage of the expiring claiming options. The changes should not affect current Social Security beneficiaries and do not apply to survivor benefits. Under the previous rules, an individual who had reached full retirement age could file for retired worker benefits – typically to enable a spouse to file for spousal benefits – and then suspend his or her benefit. By doing so, the individual would earn delayed retirement credits (up to 8 percent annually) and claim a higher worker benefit at a later date, up to age 70. Meanwhile, his or her spouse could be receiving spousal benefits. For some married couples, especially those with dual incomes, this strategy increased their total combined lifetime benefits. Bankruptcy is a way to give people a “fresh start” after struggling with debt and can be done once every eight years. There are many myths of bankruptcy, for example, you will lose everything you own, bankruptcy hurts your credit for 10 years and you are a bad person for declaring bankruptcy. There are options to try to avoid bankruptcy on your own, according to bankruptcy lawyer Karen JM Mitchell, Esq. Exploring bankruptcy alternatives such as creating a budget for your realistic, monthly expenditures for current living, including mortgage and car payments, but exclude all other existing debt could be an option. With the money you have available each month after paying your current living expenses, can you pay off your existing debts at the current interest rates in three years? If the answer is yes, you might not need to file for bankruptcy. If you cannot reduce expenses, increase income, negotiate rates or sell assets to make that possible, than bankruptcy may be a realistic opportunity for you. Filing bankruptcy is nothing to be ashamed about. The law is designed to give people a “fresh start”. Think about where you will be in three to five years. If you continue to struggle to stay ahead of your debt, let alone pay it off, think about where you will be in the same period of time if that debt were gone, now. Only a skilled bankruptcy attorney can help you decide which alternative is best for your particular situation. Don’t wait until you have lost everything to get the help you need. Growth – At different times in your life, you will have various goals – purchasing a first or second home, sending your children to college, enjoying a comfortable retirement, and so on. While these goals are diverse, they all have one thing in common: To achieve them, you’ll need some growth potential in your investment portfolio. The nature and the extent of the growth-oriented vehicles, such as stocks and stock-based instruments, in your holdings will depend on your specific goals, risk tolerance and time horizon – but growth opportunities you must have. Income – Income-producing investments, such as bonds and dividend-paying stocks, can help supplement your earned income during your working years and provide you with a valuable income stream when you’re retired. Plus, bonds and other income-producers can help balance a portfolio that might otherwise be too heavy in growth vehicles – which, as you know, are typically higher in risk. Protection – You can’t just invest for your future – you also have to protect it. If something were to happen to you, would your family be able to remain in your home? Would your children still be able to go to college? To help ensure continuity and security in your family’s lives, you’ll need to maintain adequate life and disability insurance. Also, you will need to protect your independence in your retirement years, as you no doubt would want to avoid burdening your grown children with any financial burden. To attain this type of freedom, you may have to guard against the potentially catastrophic costs of long-term care, such as an extended nursing home stay. A financial professional can suggest ways of meeting these expenses. Legacy – After working hard your whole life, you’d probably like to leave something behind to your children, grandchildren, other family members and possibly even charitable institutions. To create the legacy you desire, you will need to create a comprehensive estate plan. Because such a plan may involve a will, living trust and other complex legal documents, you will need to work with your legal and tax advisors. Try to put these pieces together to help complete your financial “puzzle” – when you do, you may well like the picture that emerges. The Windham Planning Department is currently sponsoring a photo contest to be used in the Comprehensive Master Plan Update and possibly future projects. They are looking for images of Windham that represent who the residents of Windham are, how they live, the history and the places and things that are important to them. Categories are community, history, nature, public events and leisure activities. There will be two divisions, one for students in grades k through 12 and an open division for everyone else. The contest is open now and will accept entries until Tuesday, March 1st, which is when public voting will begin. Public voting ends on March, 31, 2016. Prizes will be award to the two winners and two runners up for each division. The winner will receive a $100 gift card and the two runners up will receive a $50 gift card each. The photos will remain property of the person who submitted it, but the Town of Windham will have use of it for any of its projects, including the Comprehensive Plan update. The only ones not able to enter are Town of Windham employees and their families. For more details on how to enter the contest and all of the fine print, visit www.windhammaine.us.